SUMMARY: Allison Sekemoto hates vampires, and she refuses to register to be their "blood cattle." But life as an Unregistered isn't easy. Allison and her small band of Unregistered humans must forage and scrounge for food every day. On one of her foraging missions, Allison is attacked and mortally injured. 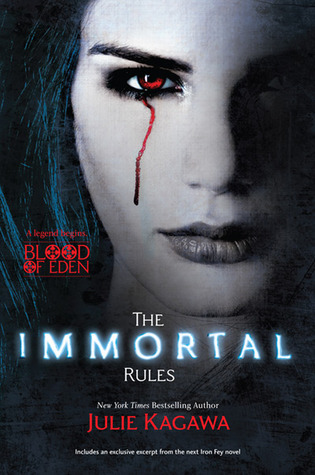 As her body dies, Allison is given a choice between death and immortality. Ever the survivor, Allison chooses to live as a vampire--the thing she hates most. WHAT I LIKED: Top-notch world-building! Allison's story takes place 60 years into the future. A virus has changed many people, vampires, and animals into rabid creatures hungry for blood. Once-bustling cities have crumbled into moldy ruins. Powerful vampire governments have set up systems to protect humans from the Rabids while at the same time allowing vampires to freely feed on the humans. The forests, both beautiful and dangerous, are slowly reclaiming the land the cities took up so long ago. There's vampire royalty and history that I believe has only been barely scratched at in this first installment of the Blood of Eden series. Kagawa pays close attention to details, and what seems unimportant at first may become important later. Beautifully-flawed characters. As a human and, later, a vampire, Allison isn't perfect. Her decisions vacillate between self-preservation and self-sacrifice. In constant danger, Allison really wants and needs to look out for herself only, but even as a vampire, Allison's humanity shows. She doesn't want to care about people, but she does. She knows she can't save everyone, but she risks her life to rescue those she can save and grieves for those she can't. She's a bloodthirsty vampire trying to resist her urge to feed on humans, but she must give into it eventually. She's a survivor, no matter what it takes. I also love her romantic interest, Zeke, who is just as strong and stubborn as Allison is. They are pitted on opposite sides of a war, and I have no idea how their relationship could possibly work out in the end (but I hope it does!). For me, these "impossible" relationships are the most interesting in the books I read. You feel almost positive they'll end up together, but finding out HOW they'll work that out is a huge part of the fun! Action--tons of it. Even major characters can die. No one is safe, and knowing that will keep readers turning pages. WHAT I DIDN'T LIKE: It's almost 500 pages, and there were some parts I feel could have been condensed a bit. There were several parts where I could easily put the book down. It's not a huge deal though, and it is seriously the only thing I can think of that I didn't like. THE BOTTOM LINE: Some of the best world-building and character development (esp. Allison) I've seen. It reminds me of The Darkest Minds (Bracken) and The Hunt (Fukuda), two of my favorites. STATUS IN MY LIBRARY: We have it, and it's popular. I will be recommending this one to my readers who don't mind violence and gore. A great choice for readers who love horror. Even with a female protagonist, it's not "just for girls."